Piper Nelson is going through the motions. She teaches school and she helps care for her nieces. The only problem is that alcohol is getting in the way and even she is starting to notice it. She was once a stellar teacher, favored by the students, but when the principal removes her from her class because she was passed out on the desk, Piper begins to realize that changes are needed. Her sister is marrying a famous sports star. She’s more interested in the reality television show they’ll be starring in than being concerned for her daughters or her sister. Her mother is married to a prominent evangelist. You would think she would help and Piper even tries to help herself by attending church, which results in disastrous and embarrassing moment for herself, her mother, and her stepfather. Piper uses alcohol to self-medicate, a means to help her deal with the death of her daughter. Piper has a secret; the accident was her fault. And while she divorced her husband soon after their daughter’s death, she can’t seem to let him go, until he becomes interested in another woman. Piper wanders her neighborhood, paying tribute to alters placed on the streets remembering those taken. She identifies with the loss, the need to preserve something. She also spends time in the cemetery by her daughter’s grave. The one bright moment in her life was meeting Selwyn. They spent an evening staring at the stars. Astronomy is Piper’s favorite topic. She was introduced to the stars, planets, and universe by one of her mother’s old boyfriends. She still doesn’t understand why her mother didn’t marry him. Instead she married the pastor and took young Piper away from the only person she felt close to. Faced with the probability of losing her job, Piper seeks help. She finally finds it in AA. She balks when they tell her to seek a higher power. She doesn’t want anything to do with her mother’s god. Her sponsor encourages her to think of the universe as her higher power. Piper begins to heal, but her recovery is full of mistakes. As I read the first few pages of Shake Down the Stars, my first thought was what in the world can I have in common with Piper? My favorite books are the ones where I identify with characters. But as I was drawn into the story, I felt Piper’s pain. I regretted her bad decisions and I cheered her good ones. My sister died at eighteen. And while I mourned her loss, it could not compare to the loss my mother felt. It consumed her for months, even years. My mother never got over the loss, but she learned to live with it. The loss of a child is the most horrific loss a person can endure. 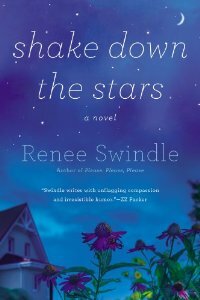 And Renee Swindle’s novel, Shake Down the Stars is true to the pain and yet there is hope too. You should definitely read the novel and join Piper on her road to finding her new normal. You’ll never look at the stars the same again.